In 1963, civil rights was the dominant public issue in the United States. Civil rights organizations and leaders surged to national attention in the spring of 1963 in Birmingham, and in the summer of 1963 at the March on Washington. 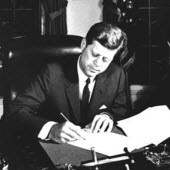 President Kennedy responded in turn to the civil rights movement by proposing the most comprehensive civil rights legislation since Reconstruction. This legislation eventually became law in 1964; but, as we know, Kennedy did not live to see this historic triumph. His life was tragically cut short when he was assassinated on November 22, 1963. Read the records of civil rights during the 1960s in ProQuest History Vault modules: The Black Freedom Struggle in the 20th Century; NAACP Papers Collection; and American Politics and Society from JFK to Watergate, 1960–1975, including Associated Press records. Plus, browse full-text articles in the Black Studies Center as well as coverage in ProQuest Historical Newspapers and Black Historical Newspapers.